What I like: A lot of decisions - explore current holdings or invade new provinces, building choices, leveling up heroes and units, etc. Always seems like there is something to do. Tactical battles are fun! AI seems pretty good. Not So Much: Turn times even makes normal size maps a bit of a chore. Still some bugs. Other Stuff You May Like: A lot of game for $20, assuming the problems get fixed. The Verdict: The game itself is very good, but AI turn times make all but the smaller maps tedious by mid game. Luckily they are looking into it and hopefully can fix it soon. You might want to hold off if you can't tolerate bugs - a small portion of which may prevent finishing some of your games. Disclaimer: This review is based on a free review copy provided by Snowbird Game Studios. Sometime last year I stumbled across a review of an old game, Eador: Genesis and found myself purchasing it on GOG. 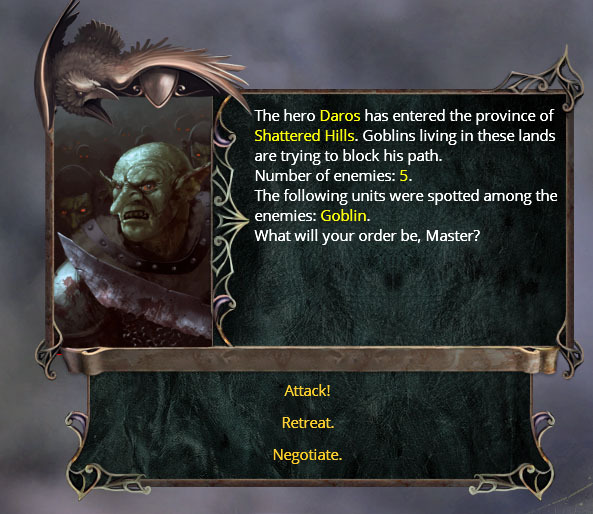 Even though the game shared many features with games such as the Heroes of Might and Magic series, Eador had a very distinct feel all its own. Once I learned that Eador: Genesis was getting a face lift in the form of Masters of the Broken World (MotBW), I decided to shelve Genesis and wait. MotBW is a turn-based 4X game set in a fantasy world, with magic, monsters and a ton of buildings to build in your stronghold. Starting from your initial province, your hero(s) will expand your holdings until all enemy capitals are captured - if all goes as planned. There are no alternative victory conditions. As I've mentioned in practically every other review I've done I'm not into multiplayer gaming, so please refer to other reviews or the official forum to see what is provided for multiplayer. MotBW provides a lengthy campaign and randomly generated worlds to conquer, so replayability shouldn't be an issue. I won't get into the back story too much here because my reviews tend to be too wordy as it is. Essentially, the world has been broken into shards and it is up to you to conquer them. The campaign provides some lengthy dialog to read if you want some context for your conquests. Some of it is amusing, but sometimes I found it goes on for too long. If you find yourself wanting to get to the action it is easy enough to abort the conversations and get to the game itself. 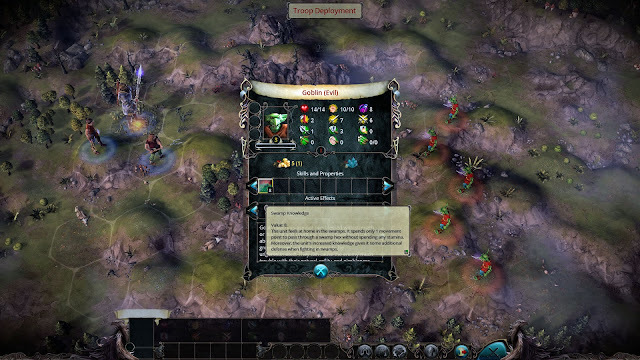 The campaign starts off with a tutorial shard to ease the player into the game. 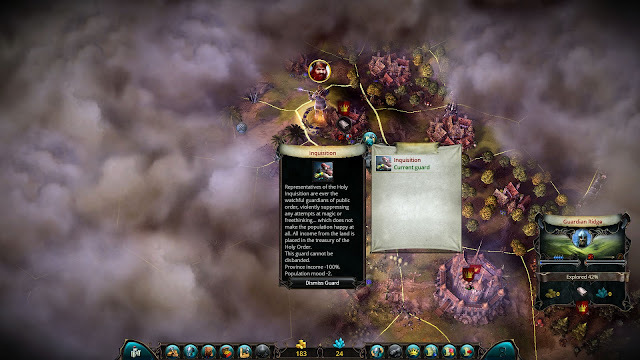 Frequent tutorial messages are displayed to introduce new aspects of the game and continue well past the first shard. I found the tutorial extremely useful. The campaign slowly unlocks buildings as shards are conquered which also helps new players into the game because MotBW has a lot of buildings with complex prerequisite relationships. In fact, unlocking buildings is part of the campaign's meta game. 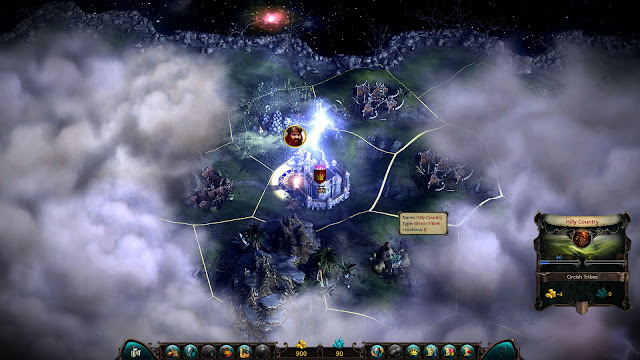 The player chooses which shards to conquer and therefore which buildings get unlocked. Shards also generate energy which can be used to purchase rewards to make a particular shard easier to conquer. The randomly generated 'non-campaign' shards have a variety of options to customize the experience. Most of the options involve the type of terrain the shard will contain, but several other settings exist as well. There are 8 sizes of shards (from 6x6 to 20x20), up to 15 AI opponents, fog of war and diplomacy can be toggled on or off, and 12 different types of shards that affect different aspects of game play - such as the rate experience is gained. These different shard types can shake things up enough to breathe some variety into the game. Creating the largest world with the maximum opponents had initial turn times of around 30 seconds on my core i7 system with 8 gig of RAM. Since turn times tend to increase I didn't stick with it and switched to an average world with 3 opponents. Initial turn times were around 5-7 seconds. Note: The diplomacy options appear to not be functional as the only options which were enabled were to make war or peace. It would have been nice to be able to trade and make alliances, but even without the those options the game still offers plenty to do. One word of advice, do not judge the game based on playing the beginner difficulty level. Beginner is fun for learning the game, but starting with fewer resources really changes how the game plays. Also, on beginner the player gets an estimate regarding how difficult a battle will be. The manual seems to be a work in process. It currently covers the basics well enough to get started. Good always overpowered the evils of all man's sins. Sorry, my brain took a turn somewhere else. The beginning game of MotBW starts like many other games of its type. One lone hero surrounded by the fog of war. While more powerful than the starting units, the starting hero is quite weak compared to their future selves. Heroes are very important as troops can't move around the map unless they are commanded by a hero. Heroes have a lot of characteristics that determines how they perform, which improve as they level up. The number of troops they can command, damage they can take, spells they can memorize, and more is based on their characteristics. Every time they level up, the player also gets to choose a class-based special ability to further customize their hero. Later they can either specialize in their class or take on an additional focus. Heroes can also equip a wide variety of items that are won during their battles or purchased at stores. Equipment can make a huge difference in the outcome of the battles. Heroes have attributes that effect their performance in many ways - melee & ranged attack and defense, counterattack, magic, and more! As heroes improve, they can lead more numerous and powerful troops. The same goes for spells. Even my starting warrior can cast tier 1 spells provided I build the required buildings or find scrolls, but it will take some development before his repertoire grows. His spells will never be as powerful as a wizard's, but he will be great at busting heads. Spells can provide an alternative set of skills, such as healing or a couple ranged attacks to augment any class. After hiring a hero of a particular class, heroes of that class gets more expensive - a little motivation to spread the love around. Each class definitely has its own feel, so it is worthwhile playing with a variety of hero classes. The shards in Eador are sectioned into provinces. Most of these starts off as neutral and one of the races will call the province home. Naturally, you need to expand your holdings by claiming these neutral provinces for your own. Sometimes you may be able to persuade them to join your realm with some coin, or by completing a task, but more often you will probably have to take their lands by force. The races respond differently to your requests to parlay and add some personality to exploration. Provinces earn the owner income in the form of gold and gems. 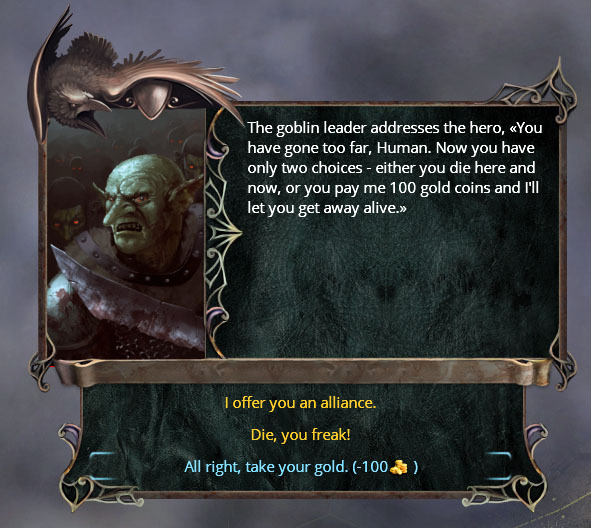 Gold is the game's form of currency, used to pay for buildings, troop recruitment and maintenance, and event responses. Gems are typically used for items of a more magical nature. As the population grows, so does the province's income. Each province also has a mood indicator and if the inhabitants are unhappy, unrest will start to accumulate. Eventually this discontent will come to a head and the populace will revolt. You can try to keep them happy to prevent this, or if it becomes inevitable at least station some guards there to quell the rebellion and retain control. The game could really use a tooltip to explain the factors that go into a province's mood. Guards are actually an interesting aspect of the game as they can have effects other than combat performance. Choosing the right guard isn't always the matter of choosing the one strongest in combat. defeat and loot to be gained, but there are other types as well. Shops selling equipment may be discovered or even locations doling out a quest. Some locations grant access to recruit units not available in your stronghold. Attempting to conquer any of these special locations launches a tactical battle against the location's inhabitants. One of the primary questions to ask yourself each turn is whether to try and take over a new territory or visit a special location in a province you already own. The terrain is varied and affects many aspects of the province. Some may generate more gold income, while others contain greater amounts of gems. Swamp takes longer to travel through than plains. The tactical maps depend upon the terrain of the province too. One of the features that differentiate MotBW is the concept of a province's exploration level. The population of a province may be limited until more area of the province is explored. Exploration may also uncover more special locations to visit. The scout class is a natural at exploration. The act of exploration isn't interesting in itself as the player just assigns a hero to explore and the results are reported the next turn, but the concept does add another important item to consider each turn. Provinces may also contain one of many strategic resources, which are used to construct some buildings and troops. If your empire doesn't have access to these resources, you must pay extra to purchase these from the global market. This can significantly raise the price of items, increasing the amount of gold needed. 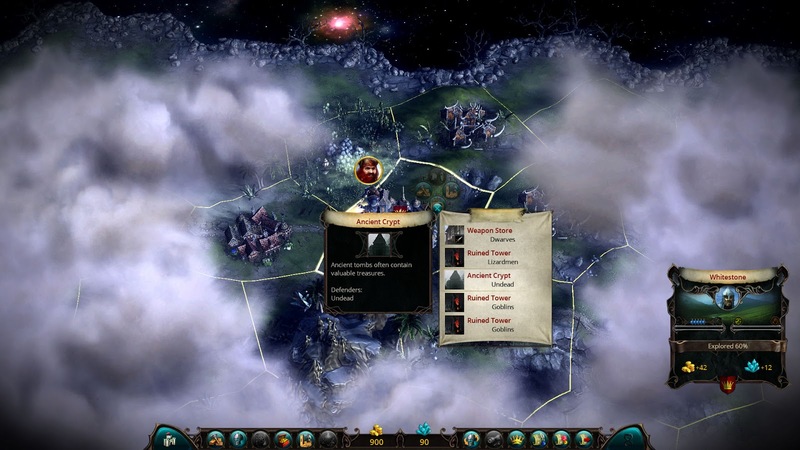 Eventually one of the AI players will be found and their capital must be captured to eliminate them from the game. The most complicated aspect of the game is keeping track of the enormous amount of buildings that can be constructed in your stronghold. There are almost 200 different buildings in all. Many have complex combinations of prerequisites. There is a basic and advanced interface to manage your build queue. The basic interface arranges buildings in a wheel organized by building type and level. It requires more clicks than the advanced interface, but tries not to overwhelm the player. Information about the selected building is clearly presented, along with its immediate prerequisites. Even though it can take a lot of clicks, the simple interface is easy to navigate. All of the building icons can be clicked to jump to their entries and the arrow buttons work just like the ones in an internet browser to navigate recently visited buildings. The advanced interface displays all of the buildings at once, along with all of the prerequisites for the selected building. I switch between them depending upon what I'm looking for. All of the buildings highlighted in red are the prerequisites that must be built before the selected building. 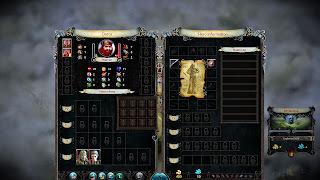 Buildings are used to unlock pretty much everything in the game - troops, spells, shops that sell equipment, other buildings, static bonuses, and provincial guards and improvements. 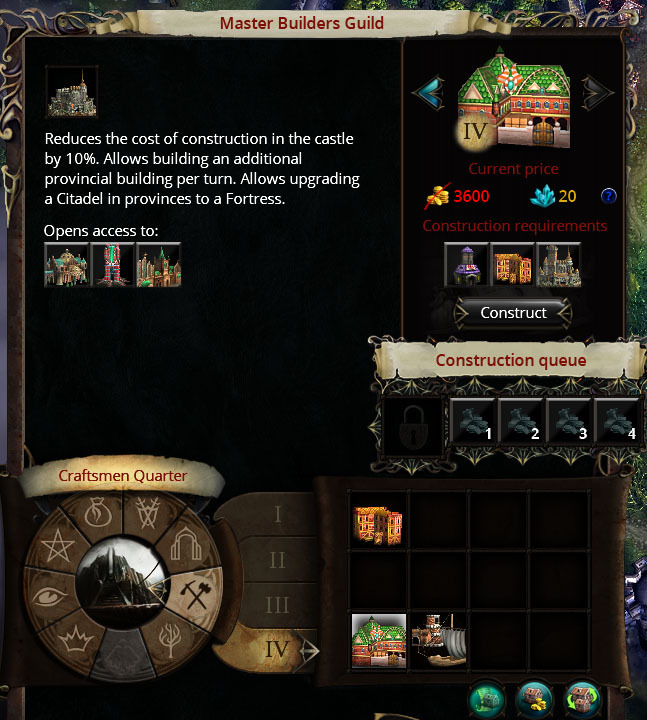 The game definitely provides a lot of choices when it comes to building improvements, either in your stronghold or provinces. 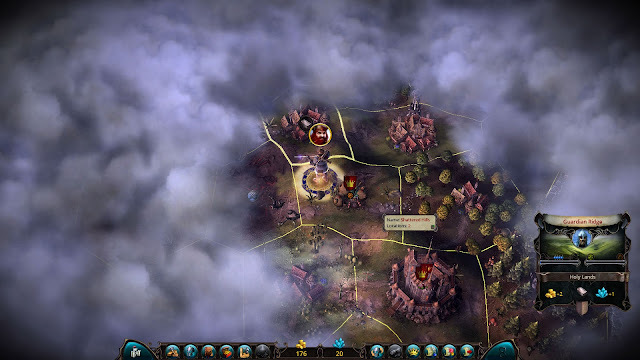 One stronghold building and one provincial building can be built per turn at the start of the game, providing you have the resources. MotBW also places a limit on certain types of buildings, forcing the player to make some choices. 96 spells are divided into 6 different schools, with each school having 4 different levels. All of the spells are unlocked by building the appropriate buildings, or you can be lucky enough to find a scroll on your travels. Most of the spells are cast in combat, but rituals are cast at the strategic level. 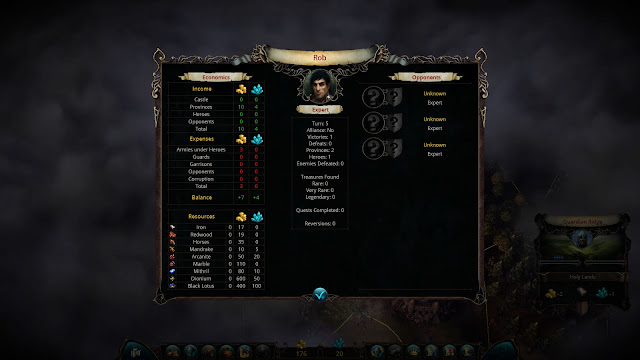 While people who have played games of this type probably won't find the spells particularly unique, they are varied and add interesting options to both the tactical battles and the strategic layer. Magic will definitely play a prominent role for the wizard class. There is a lot of combat in this game, and that is mostly a good thing. Combat is turn based, played out on a hex grid. Sides alternate taking action with all of their units. Each battlefield has mixed terrain based on the province they are in. 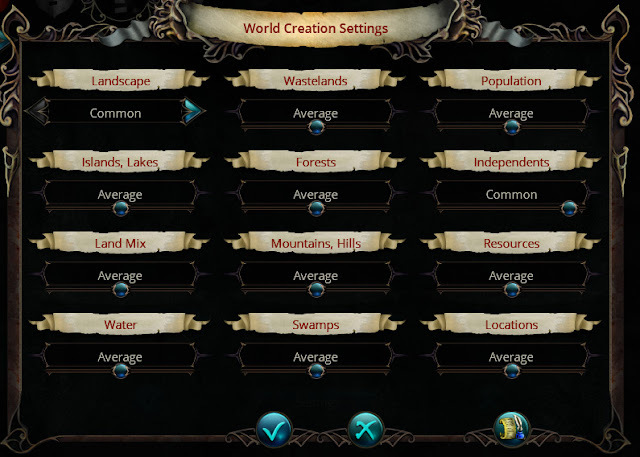 Plains, forest, hills, and swamps each have their own characteristics, from bonuses and penalties to movement costs. Swamps may slow down your troops, but creatures native to those lands, like goblins, can move through it freely - even gaining a defensive bonus. Actions cost stamina and if a unit gets too low its performance will suffer. Resting will help the unit slowly recover, but hopefully it isn't getting attacked because there is no counter attack while resting. Units also lose morale when wounded or friendly units die. Like stamina, their combat performance is affected by their morale. If their morale is low enough the unit will flee. Killing enemy units improves morale. Some spells can also strike fear into units - bringing them ever so closer to fleeing. I've found that the units recruited in the stronghold start off a bit duller than the ones encountered in the wild. Many don't have much in the way of special abilities until they have some experience under their belt. This doesn't seem to be true of units on the other side of the battlefield. As far as I can tell, the diplomacy options haven't been developed yet or some bug is preventing them from becoming enabled. Up until now I've been playing on beginner because there is a lot to get familiar with in this game, especially the buildings. I decided to kick up the difficulty to expert, which is the level where the player doesn't receive bonuses. Right off the bat I can tell I'm going to have a harder time. My starting resources are dramatically lower, so I can't use my typical opening. This means I won't have my usual repertoire of starting spells and I won't be as nicely equipped. The special locations in my starting province look too tough for me to handle at this time, so I can't milk them for loot and experience. One is a harpy lair and after bribing the leader with some gold I could get the OK to hire some for my army. Unfortunately they are tier 2 creatures, which I can't command yet. They are also evil, so hiring them will lower my karma. The effects of karma need to be explained better. The manual states it only effects your relationship with other masters (your AI opponents), but posts on the forum state you get more negative events with bad karma and more good events with good karma. The barbarian tribes to the south offer the best income, but I don't think I could handle them either. I settled on attacking the goblins even though their province is pretty poor. Maybe they will have some suitable locations to explore. I'm not going to pay you so I can retreat. Will they be open to an alliance? I guess they think I'm too weak to entertain an alliance with me. 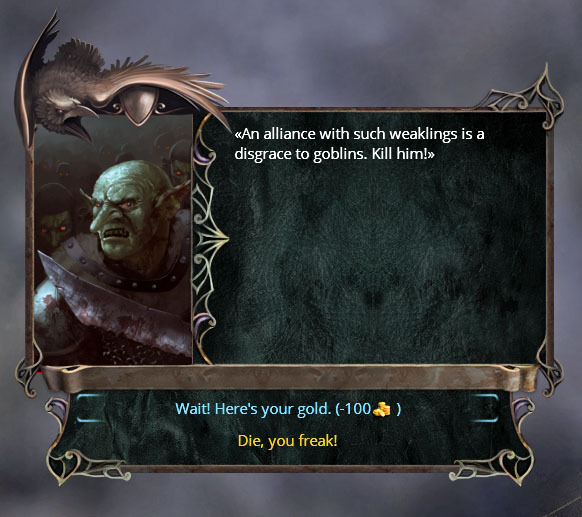 I didn't really want an alliance with this goblin scum anyway. The battlefield is quite hilly since we are in a hilly province. Goblins like the swamp, but will find none on this battlefield. My slinger softened up the approaching goblins while my hero damaged them with a couple weak spells. Since the slinger was on a hill he could shoot a bit farther than normal. Once the goblins got close my militiaman and hero beat them down with melee attacks. This used up a bit of stamina so I eventually had them rest, but the goblins were getting low too, especially after getting hit with a fatigue spell. This brought him to 0 so he was unable to act until he rested. Alas it was too much for the militiaman, but my other two units survived and I acquired a new province! One thing I prefer in MotBW over a game like Heroes of Might and Magic is that unit stack sizes don't increase, so no attacking with 10,000 swordsman causing 80000 damage. The fog of war was peeled back to reveal some new neighbors. To the west is the land of the dead, which provides no income since it is pretty much uninhabitable to the living. To the north lie some holy lands which have iron! That can be useful. Having iron would save me 17 gold for any unit or building requiring 1 iron. There be iron in thar hills! I'm a little weak after that battle. Let's see if I can peacefully acquire the promised lands to get the iron. Then I can build a swordsman school to add a bit of strength to my army. Apparently they think I'm a sinner, but agree to join my realm. Unfortunately the inquisition province guard remains and can't be disbanded. I guess that is what they meant by 'they won't follow my orders'. The inquisition takes any income from the province, but luckily leaves me access to the iron. The inquisition also makes the populace unhappy. I can only get rid of the guards by attacking them or letting the province revolt and then retaking it if the rioters defeat the guard. For now I'll be happy with my iron. After building the swordsman school and a trek back to the castle I hire one swordsman. I'm not used to the money problems in expert difficulty and now realize with the swordsman's maintenance my cash flow is now negative. It's time to visit the ancient crypt in my new province to hopefully get some cash. Items start to wear out, so while I am at the stronghold I pay 6 precious gold to get them repaired. Another feature that adds some personality to MotBW is the random events that occur from time to time. They aren't fully random because at least some of them are based on the current conditions of the provinces. They typically have at least 2 responses - a good one and a bad one. I typically play the good guy. One aspect of these events I don't like is that you can't really get a clue as to what your responses will do. Take this event for example. What will happen if I thank him? Or bless him? Or select the other responses? The top two are obviously the 'good' responses and the bottom two the 'bad' or selfish responses. I would prefer more transparency into the possible outcomes, such as the 3rd one gives a 50% chance of getting half peacefully, a 25% chance of getting attacked, and a 25% chance of him declining and giving the player the choice of attacking. I'm sure some people prefer the surprise of having the outcomes completely unknown, but I like to make informed choices. In this case I gave him a blessing, even though my gem supply was limited. 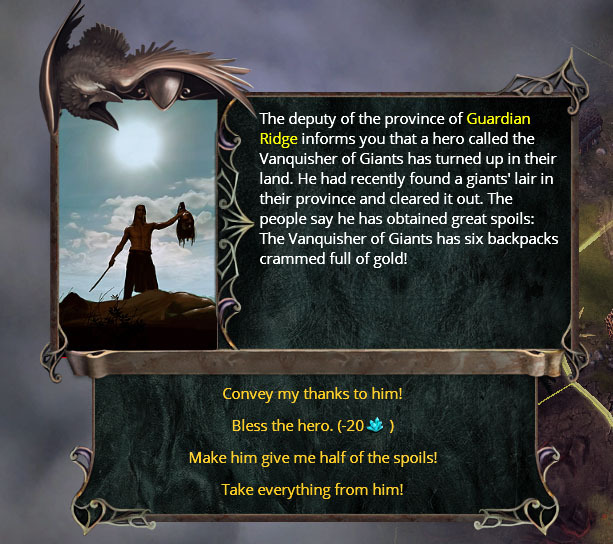 He in turn gave me 400 gold which I could keep or distribute to my people. If I was playing on beginner, I would distribute it, but on expert I really need that gold. The more provinces you own, the more events that seem to occur. This can actually become too much. I wish the event frequency was configurable. ...much time has passed. I'm on turn 115 and after building up my economy I decided to press the attack on my neighbor. One thing that makes it difficult to know when to attack is that you can't view the hero of another player until you attack him. I almost pulled off the victory in this battle, but his hero was about 11 levels higher than mine and he had a tough troop with him. I will resurrect my hero and try to hit him while he is still weak. ... Looks like the AI got the best of me on my first game at expert. I am slowly losing a war of attrition with my holdings getting smaller. It's time to try again. While the interface is generally good, there are places that could benefit from more information. When hiring a provincial guard, there is no way to look at the stats for those guards. Only a brief explanation describes them. Once I visit a location, it would be nice if it were tracked in the list and the inhabitants noted, since it is possible to retreat and come back later. Other areas could be improved, but none of these shortcomings dramatically affect play. Some of the terrain is difficult to identify in the tactical battles. Some plains look like hills to me. The popup window in the advanced building interface can be a little awkward and get in the way. Tooltips could pop up a little faster. It would be nice if the terrain info window in combat would only appear while holding down the right mouse button and disappear on release instead of having to click a button. Sometimes using the keyboard arrows to scroll isn't responsive, forcing the user to release the key and try again. In general there are some areas that could use some polish to improve the user experience. There is a great range of difficulty settings and they affect more aspects than just getting bonuses. The lower levels limit how much the AI will improve their lands. Also at the beginner level the player gets a hint about how hard combat will be, so they can make a more informed decision about whether to continue the attack. The AI has held its own against me when playing on even footing at expert level. The tide will probably turn after I get more experience under my belt. The AI can definitely give the player a challenge even though I have seen some questionable moves in combat. Sometimes the AI chooses a poor order to move their units, causing a unit to take an inefficient path to their target The AI has sent his healer to a quick death by assaulting my melee units. The AI will usually finish off a weakened unit, but there have been times where they didn't for no reason apparent to me. It doesn't appear that the AI ever holds back his melee troops. Since they always pursue your troops, the player can sit back and try to pick the best place to defend. The upgrade in visuals is the primary reason to upgrade to Masters of the Broken World over Eador:Genesis. I find them worthwhile and they really do enhance the experience. This is a nice looking game. I'm a sucker for orchestral-type music in fantasy games and this has it. I'm not sure how many tracks there are, but it can probably get repetitive to those who are susceptible to that. I don't recall hearing any tracks that were grating or a distraction. I did have 1 crash to desktop error, but didn't lose much due to the autosave feature. Going back a couple turns let me get around the problem. I also had a problem where the game hung when I ended my turn and couldn't continue. There have definitely been some smaller annoyances too. At times the game doesn't allow me to move my hero on the map until I enter the stronghold interface and exit again. With the last update the turn times were negatively impacted. Even on a small map with 2 AI opponents turn times approached 30 seconds until I eliminated the offending AI player. Then times dropped back into the 2-5 second range. On an average map with 3 AI players turn times increased from 7 seconds on turn 1 to just over a minute by turn 85. The developers did let me know that they are looking into this. I would probably avoid playing on the larger maps with lots of AI opponents until the issue is resolved. Other than my 1 game that I couldn't continue, the problems have been annoyances rather than critical issues. Once the kinks are ironed out, Masters of the Broken World will be a great addition to the turn based strategy genre. Even with the problems, I have had more fun than not. While most of the improvements over Eador are cosmetic in nature, there has also been some retooling of the campaign and the addition of different shard types. There are a lot of choices to sink your teeth into at the strategic level - expand your holdings vs exploring your current provinces, what improvements to build from the expansive selection, leveling up heroes and units, event responses and more. The tactical battles are great fun. 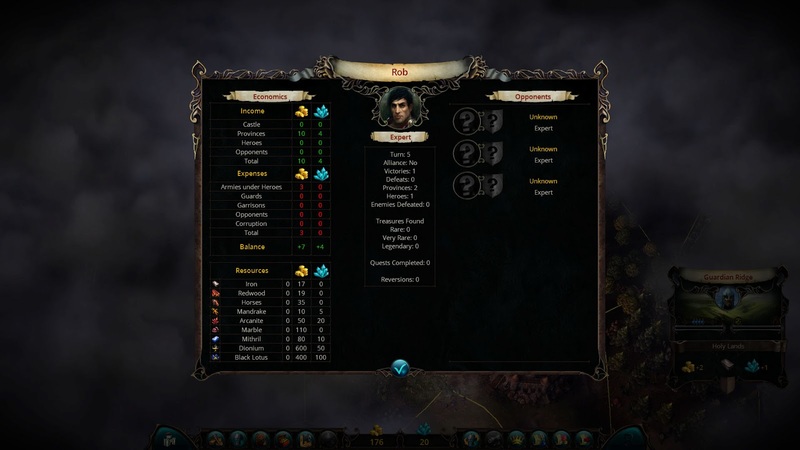 Unit abilities, spell choices, and terrain all factor into whether you're victorious in combat. I think most players can find a difficulty level to provide a good challenge. Whether you should buy the game now or later depends on how you feel about bugs and some needed polish. If you can tolerate some annoyances and are a fan of this type of game, by all means get it now. Lots of fun can be had as is. You probably want to avoid larger maps and numbers of opponents until the turn times are tamed, unless you don't mind doing other things while the AI takes its turn. If you're not tolerant of such things it may be best to hold off. A downside of not playing the larger maps is that I haven't been able to make use of many of the buildings because the game doesn't last long enough. The developers have come out with several updates already and I believe they are committed to improving the quality of the game. Once the major issues are fixed I can see myself playing this one for a long time to come. Until then, I will probably dip my toe in for a quick fix.